Phytoecia (Pilemia) kruszelnickii, recently described by Wojciech Szczepański and Lech Karpiński [❖], is and endemic Greek Pilemia closely related to Phytoecia (Pilemia) hirsutula (Frölich, 1793) and Phytoecia (Pilemia) moreana Breuning 1943. This interesting species is distributed exclusively within the continental part of Greece (Thessaly region). P. kruszelnickii differs from two related and the most similar species (P. hirsutula and P. moreana) by a considerably larger body size (ca. 1.5× longer). The body length of the examined species of P. moreana and P. hirsutula did not exceed 9 mm while the length of P. kruszelnickii ranged from 10 to 14 mm. Furthermore, P. kruszelnickii has a brighter pubescence compared to the other species. There is also a difference in the length of the antennae of P. moreana, which are noticeably longer in both sexes. The antennae of the males of P. hirsutula and P. kruszelnickii do not reach the end of the elytra, whereas in the males of P. moreana, the antennae usually reach its ends. Moreover, there are clear differences in the morphology of the lateral lobes [❖]. The depicted beetles were collected on the host plant (Phlomis samia) by our friend Lech Kruszelnicki ca. 2 km SE of Vlachava (Thessaly, Greece) on 06.06.2016. 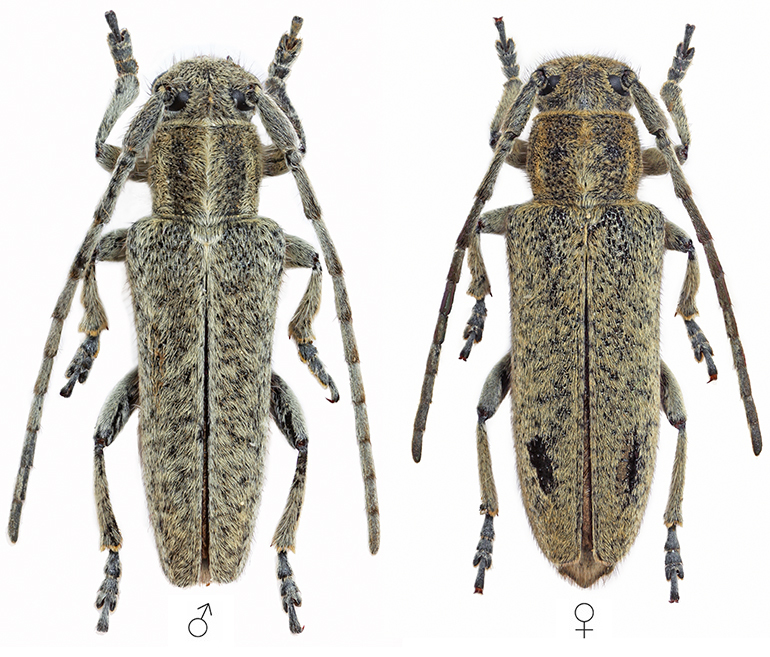 A new species of the genus Phytoecia Dejean, 1835 (Coleoptera: Cerambycidae) from Greece.